miR-197 represents a molecule that is associated with a wide range of pathologic conditions ranging from type 2 diabetes mellitus, myocardial infarction, metabolic syndrome, multiple sclerosis, preeclampsia, hepatitis B virus infection to major human malignancies such as lung cancer, hepatocellular carcinoma, pancreatic cancer, thyroid cancer or cervical carcinoma. miR-197 is distinctively expressed in diffuse large B cell lymphoma and may play a role of a biomarker with potential therapeutic implications in this disease. 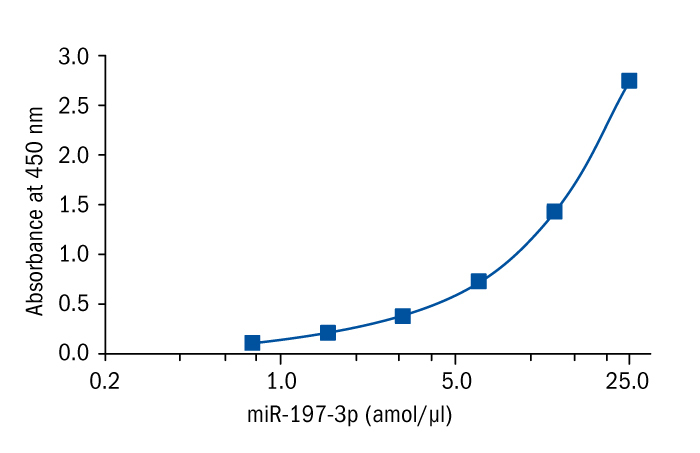 miR 197 expression was also demonstrated to be considerably downregulated in gastric cancer tissues and cell lines. Its low expression level was associated with increased tumour size, invasive depth, tumour node metastasis staging and lymph node metastasis, whereas high expression of miR 197 inhibited tumour cell proliferation and invasion in vitro. Zampetaki, Anna, et al. "Plasma microRNA profiling reveals loss of endothelial miR-126 and other microRNAs in type 2 diabetes." Circulation research 107.6 (2010): 810-817. Zampetaki, Anna, et al. "Prospective study on circulating MicroRNAs and risk of myocardial infarction." Journal of the American College of Cardiology 60.4 (2012): 290-299. Karolina, Dwi Setyowati, et al. "Circulating miRNA profiles in patients with metabolic syndrome." The Journal of Clinical Endocrinology & Metabolism 97.12 (2012): E2271-E2276. Jernås, Margareta, et al. "MicroRNA regulate immune pathways in T-cells in multiple sclerosis (MS)." BMC immunology 14.1 (2013): 32. Choi, S-Y., et al. "MicroRNA expression profiles in placenta with severe preeclampsia using a PNA-based microarray." Placenta34.9 (2013): 799-804. Chen, Li, et al. "miR-197 expression in peripheral blood mononuclear cells from hepatitis B virus-infected patients." Gut and liver 7.3 (2013): 335. Abd-El-Fattah, Amal A., et al. "Differential microRNAs expression in serum of patients with lung cancer, pulmonary tuberculosis, and pneumonia." Cell biochemistry and biophysics67.3 (2013): 875-884. Fiori, M. E., et al. "Antitumor effect of miR-197 targeting in p53 wild-type lung cancer." Cell death and differentiation 21.5 (2014): 774. Dai, Weiqi, et al. "Anti-miR-197 inhibits migration in HCC cells by targeting KAI 1/CD82." Biochemical and biophysical research communications 446.2 (2014): 541-548. Hamada, Shin, et al. "miR‐197 induces epithelial–mesenchymal transition in pancreatic cancer cells by targeting p120 catenin." Journal of cellular physiology 228.6 (2013): 1255-1263. Nikiforova, Marina N., et al. "MicroRNA expression profiling of thyroid tumors: biological significance and diagnostic utility." The Journal of Clinical Endocrinology & Metabolism 93.5 (2008): 1600-1608. Hu, Qiyan, et al. "miR 197 is downregulated in cervical carcinogenesis and suppresses cell proliferation and invasion through targeting forkhead box M1." Oncology letters 15.6 (2018): 10063-10069. Mavridis, K., et al. "The oncomiR miR-197 is a novel prognostic indicator for non-small cell lung cancer patients." British journal of cancer 112.9 (2015): 1527. Yang, Jeong Mi, et al. "Clinicopathologic implication of microRNA-197 in diffuse large B cell lymphoma." Journal of translational medicine 16.1 (2018): 162. Liao, Zhiwei, et al. "MicroRNA-197 inhibits gastric cancer progression by directly targeting metadherin." Molecular medicine reports 17.1 (2018): 602-611.